Moonlit Harbour with jockey Gino Carenza, Jane Bedford and Steve Hull. Moonlit Harbour ran 11 races for us, winning five and being placed four times. He started in bumpers and progressed to hurdles, winning off a mark of 120. 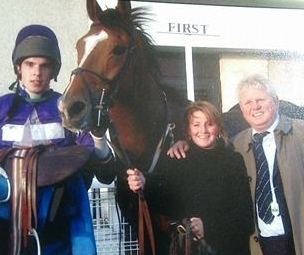 Moonlit Harbour left the yard in 2004 after being sold at Doncaster. Website © 1997 - 2019 Michael Easterby Racing. All rights reserved. Website programmed in Coldfusion ™ and maintained and updated by Tara's Art.